Kenton Yard is seen looking north circa the early 1950s. 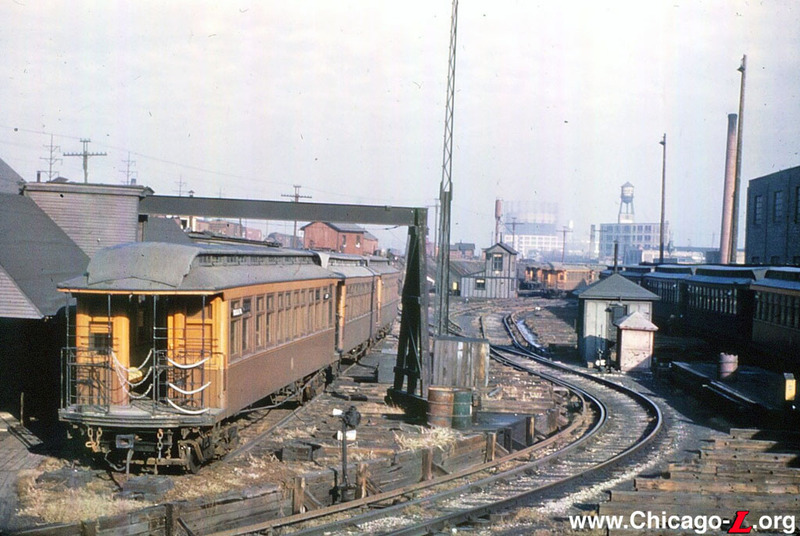 The sizable number of wood cars in the yard, at a time when the yard was being phased out (and was never use for passenger car storage), is likely due to CTA's need at the time to find temporary storage space for wood cars in the process of being retired and scraped -- Lower Wilson and Laramie yards were similarly used around the same time. The yard tracks would all be gone in just a few years. For a larger view, click here. The Metropolitan West Side Elevated Railroad established a yard at Kenton on the Douglas Park branch in 1910. The Kenton Yard was used for materials storage and interchange with the adjacent Belt Railway. The Kenton Yard replaced a facility on the Garfield Park branch used for the same purposes from 1895 to circa 1910. The Kenton material yard was closed on October 2 1952. 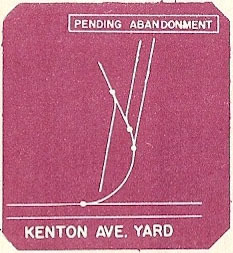 The CTA track map dated November 1952 indicates that more than half of the yard tracks had already been removed by then, and was marked as "pending abandonment"; the yard was removed completely from the CTA's track maps in the next edition in March 1953. Crews began removal of the remaining abandoned Kenton Yard tracks and switch on May 12, 1954.